Most of the times parents are so busy with the responsibilities that they are burdened with, that they completely forget to ask their kids a simple question- “How was your day?” It is a simple conversation starter to get your kids talking. However, if you don’t normally ask your kids about their day and they feel a bit aloof, here are some questions you can ask your kids that will surely help you and your kid bond and talk for hours. There’s nothing more powerful than a fun and casual conversation between parents and their kids to get their kid to open up easily. Remember that while parenting is challenging and filled with responsibilities that you weren’t ready for, it is also fun when you can bond easily with your child. 1. Who is your best friend in school? 2. What is your favourite game? 3. What character makes you laugh the most? 4. What new thing did you try recently? 5. What is something I always say to you? 6. What do you like to eat most in lunch/breakfast? 7. What kind of dreams do you have? 8. Did something funny happen recently? 9. If your pet/stuffed toys could talk, what would it say to you and what would it say to me? 10. Who brought the best food in their lunch today? What was it? 11. What is the most common toy that every kid in your class has? Do you like it? 12. If one of your classmates could be the teacher for the day who would you want it to be? Why? 13. How do you show people you care? 14. What is your favourite thing to do? 15. If you could have one superpower, what kind of superpower would you have? 16. If you had a shop, what would you sell? 17. Did something happen today that you didn’t like or that upset you? 18. What is your favourite rhyme/song? 19. What kind of gift would you want on your coming birthday? 20. Of all the outfits you have, which one do you like the most? To enhance your kid’s creative and academic skills at home, try Xplorabox. 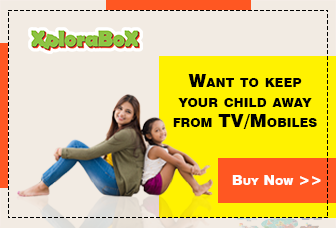 Xplorabox is a monthly subscription-based activity box for kids containing skill-enhancing offline activities and games, which help in developing motor, cognitive, and social skills in children.